As your stamp collection grows look for new ways to combine stamps that creates a brand new look and sends a special message. I've used stamps from 4 different sets to create this card. 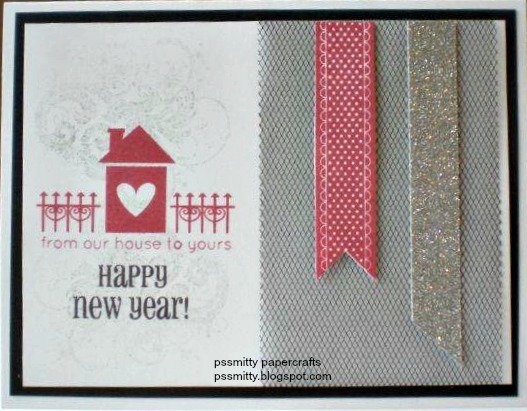 I knew I wanted to use the "from our house to yours" stamp, I knew I wanted the card to say "happy new year" and I knew these cards are going in the mail so my embellishing had to lay flat but still give dimension. My embellishments are piece of Tulle Ribbon Z1798 and a strip of Silver Glitter CS from the new Whooo's Your Valentine kit. So from our house to yours we wish you a very happy 2013!